Chernobyl: cataclysm and turning point? Chernobyl is a small village in northern Ukraine that was known by only a handful of people outside the region before 26 April 1986. On that day, Chernobyl became a synonym for the greatest technological and environmental disaster of the 20th century. Twenty-five years after the nuclear catastrophe in Chernobyl, memory of the event has faded. But even for those who remember the incident, many facts remain unknown and many questions remain open. In an internet seminar about 60 young Europeans from 19 countries tried to close the gaps in knowledge concerning the consequences of Chernobyl for European countries. Using various methods of working together, they researched for more that six months and collected a lot of exciting material. This exibition offers various possibilities of navigation: Clicking the numbered faces on the left side brings you directly into the rooms. Each main topic is assigned a colour: accident, responsibility, memories and future challenges. Within the exhibition you also can move by clicking the arrows left or right. 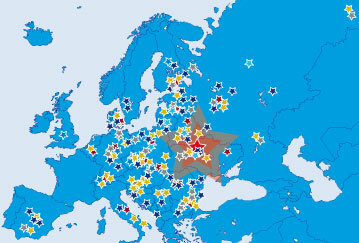 The stars on the map guide you to the participants‘ contribution (coloured stars) or to the young people who have worked on the respective topic’s introduction (grey stars). The internet seminar and the exhibition were initiatives of EUSTORY, the History Network for Young Europeans.